A popular home design trend that we are seeing in the Greater Cincinnati Area is a growing demand for outdoor fireplaces and firepits, both wood-burning and natural gas. People want to enjoy each season and spend more time outdoors relaxing and entertaining family and friends. Summers can have cool nights. Fall is spectacular. Winter is invigorating and spring is a time for nature’s renewal. In each season, a warm fire is enchanting and extends the time spent outdoors. 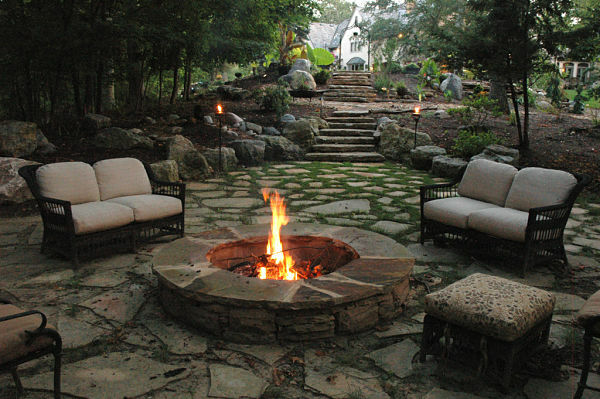 There are many design options for incorporating a fireplace or firepit into an outdoor living space. A well-planned outdoor living space design will address the setting of the home, the architectural style of the house, the needs of the users, available fuel sources, materials used for the façade, and building codes and guidelines that may be applicable. 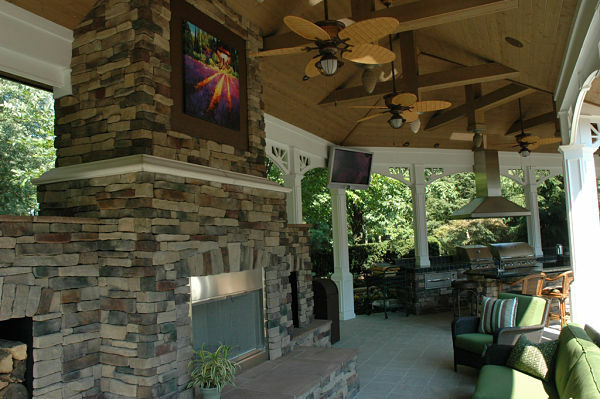 Wood-burning stone fireplace built into a veranda. A stone fireplace takes center stage in this outdoor veranda addition to the home. The fireplace includes wood storage space, a mantel that matches the trim, a glass door screen and a deep elevated hearth for additional seating. Ledgestone fireplace with wood mantel and raised hearth. This fireplace brings the inside outdoors. Features include a gas fireplace insert, mesh curtain fireplace screen, an outdoor television and hearthside table. Stone fireplace in poolside shelter. 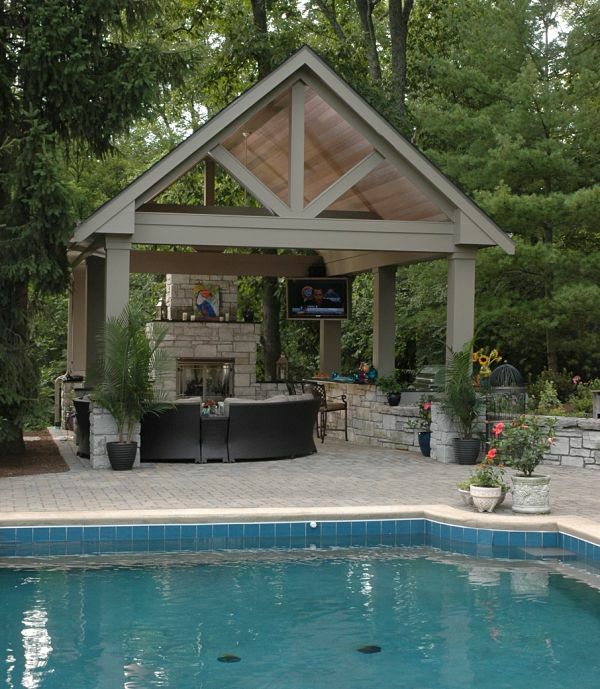 A gas fueled stone fireplace is the focal point of a multi-function freestanding outdoor shelter with areas for seating, television viewing, an outdoor kitchen and enjoying views of the pool and gardens. The fireplace includes a gas insert and glass door screen. There is a granite hearth and mantle. 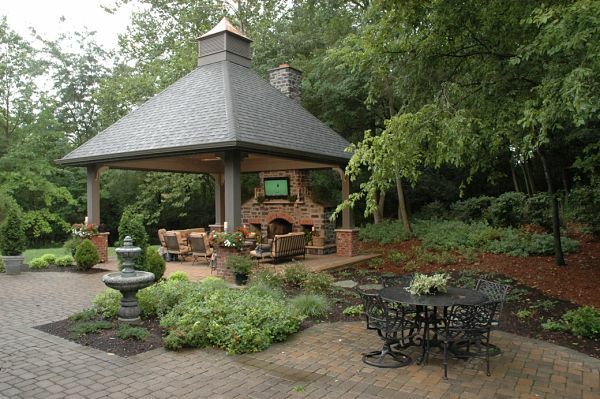 Freestanding outdoor shelter in a woodland garden with stone and brick fireplace. The stone and brick exterior of this wood-burning fireplace blends with the natural surroundings. Brick accents the arched opening and built-in storage compartments for wood. 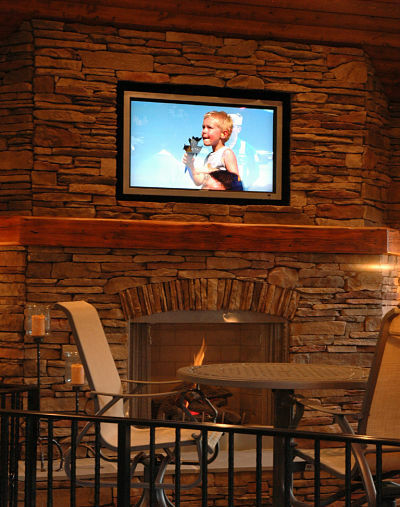 There is an outdoor television placed above the stone mantel. A black iron fireplace screen shields the embers. The hearth provides a place for tools, candles and plants. Stone fireplace in a gazebo. 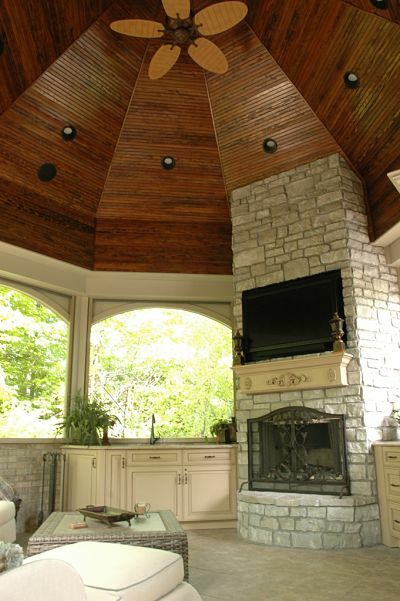 This gas fireplace was built to fit the curved and tall structure of the gazebo. The mantel matches the cabinetry and a television was placed above it. An ornate wrought iron screen was selected to intensify the impact of the fireplace in the space. The hearth is curved to complement the architecture and stonework extends to the ceiling. Fireplace on an open porch. 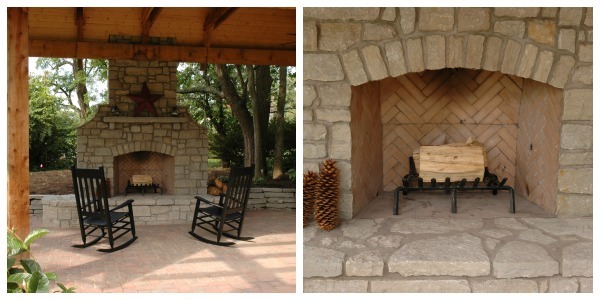 The lines of this outdoor gas fireplace are simple and the stonework matches the beauty of the home. There is no mantel and a cabinet with folding doors protects the outdoor television when not in use. Wood-burning stone fireplace in an open-air shelter. A garden path from the home leads to an open shelter with rocking chairs for sitting by a warm wood fire. The opening to the fireplace features a brick interior with brick laid in a herringbone pattern. Ledgestone gas firepit. 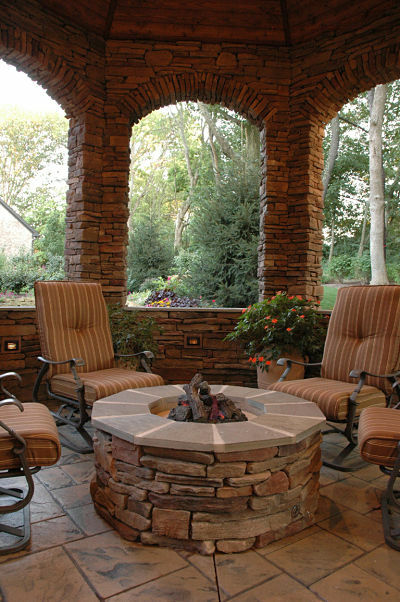 A sheltered outdoor sitting area is warmed by a gas firepit. Stone firepit on a patio. 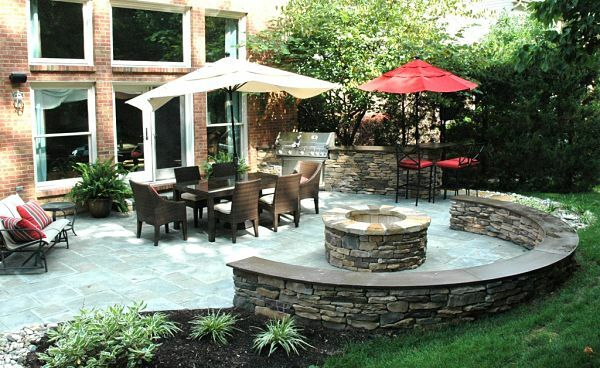 A stone firepit with a low walled seating area provides a gathering place on a patio. The stonework of the firepit matches the wall. Poolside firepit. 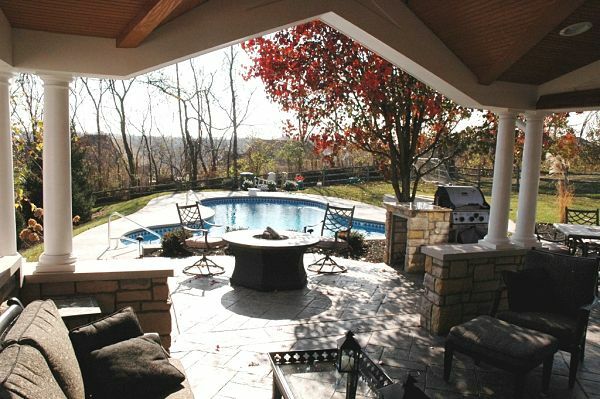 This wood-burning firepit was placed to warm swimmers exiting the pool and those sitting in a shelter patio. Note the built-in wood box to the right. Firepit in a garden setting. This wood-burning firepit blends beautifully with the rock garden of a French-country style home. What a wonderful way to enjoy the outdoors in any season.